Planet Labs, a space and analytics company formerly known as Cosmogia, is announcing $13 million in funding from DFJ, Capricorn, OATV, Founders Fund Angel, Innovation Endeavors, Data Collective and First Round Capital. Planet Labs, which was founded by former NASA scientists, plans to launch the world’s largest fleet of imaging satellites that will map the entire Earth to better understand the changing planet and ecosystems. The company successfully launched two imaging satellites in April 2013 for testing purposes. The startup was founded in 2010 by Robbie Schingler, William Marshall and Chris Boshuizen, who are all physicists who previously worked at NASA. They first met at an international conference that gathered young professionals to make policy recommendations on how space can benefit humanity, and since then all worked on small scientific satellites at NASA Ames. Schingler also worked at NASA HQ where he helped to incubate NASA’s Space Technology program. As the founders explained to TechCrunch, there are a number of government and other private satellites already imaging the Earth. Some of these public-sector-funded satellites only take imaging pictures every month and at lower resolutions. Most of the private satellites use higher resolutions but are focused on smaller areas for military intelligence. Planet Labs wants to image the Earth on a regular and expansive basis so that people, including farmers, weather professionals and more, can use this data to take actions. To do so, the company plans to deploy the world’s largest fleet of Earth-imaging satellites to image the changing planet and provide open access to that information. 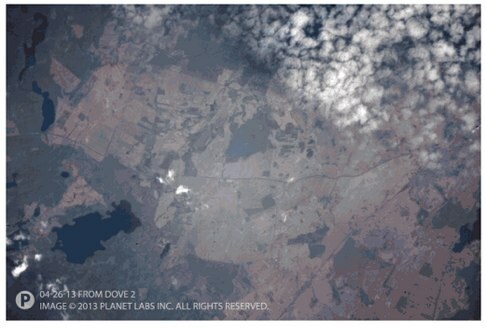 Planet Labs says these imaging satellites, called “Doves,” can provide a new image of the planet at an unprecedented combination of resolution and frequency. To best enable this, the satellites operate at a low orbit for its constellation and an optical resolution of three to five meters — a scale that allows measurement of a tree canopy, but does not compromise individual privacy. This will enable monitoring of deforestation, help improve agricultural yields, track natural disasters and many other applications. While the startup certainly has major ambitions, investors believe the company’s talent and technology are game-changing. “We’re seeing unprecedented innovation in the space industry, starting with SpaceX lowering the cost of access, and now with Planet Labs revolutionizing the satellite segment,” said Steve Jurvetson, managing director of Draper Fisher Jurvetson and member of the company’s board of directors. 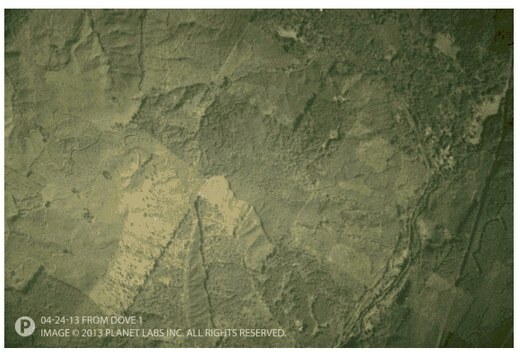 In April, Planet Labs deployed two demonstration satellites, Dove 1 and Dove 2, and the company says these have been successful in validating the resolution and expansiveness of the imagery (embedded below) and data provided by these satellites. Data from the upcoming fleet of satellites are scheduled to be available early next year. We’re told this data will be used for both humanitarian and commercial purposes. For example, one of the satellites has been able to track deforestation, and Marshall explains that farmers could use this imagery to improve agricultural yield. “We want to convert these images from satellites into data people can use to protect our planet,” he says.